Potentially, the worst television show ever. I love it! The Christian disclaimer at the start is fascinating, and after watching the program, it seems ridiculous to hold on to the concept that this pair must stay together. I mean, really, who wants to be with a guy who wishes he were Red Skelton!? Since it's election time for our friends in the USA (well, not really, it's still ten months away, but you'd never know it watching American news) I thought this would be appropriate. This CBS news special was sponsored by Westinghouse and Phillip Morris. Westinghouse eventually became the owners of CBS for a brief period before deciding their energies were best spent focusing on nuclear weapons. Enjoy the fun as we watch Walter Cronkite, Edward R. Murrow, and other CBS news legends in action as integration is the hot topic in a contentious South vs. North battle within the Democratic Party. Today we have a comedy record from Cleveland stars Tim Conway and Ernie "Ghoulardi" Anderson. Conway had performed on Anderson's regional Ohio show Ernie's Place in the nineteen fifties. Many years later, when the two had individually moved to Los Angeles in order to further their showbiz careers, they teamed up to form a comedy team - the one on display on these two albums. 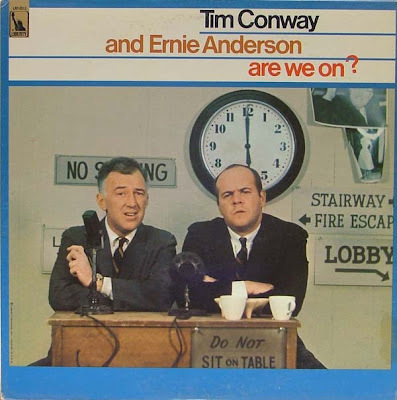 They were released a few months before Conway found fame on The Carol Burnett Show, a gig that had a schedule that would no longer allow Tim to continue working with Ernie. Anderson went on to be the voice of ABC for many many years. Listen to a sample of Ernie's voice work here and you can find the hilarious and profane Ernie Anderson blooper mp3 over here. Listen to both of these comedy albums here. For the next little while, whenever I come across an old TV show with Allan Melvin in it, it'll be plastered on the site immediately. It shouldn't be too difficult since he's in seventy percent of the things I watch, however, if you were to do a YouTube search for his name, only a couple of things will come up. But he is all over that and all the other video sharing sites if you know where (and how) to look.